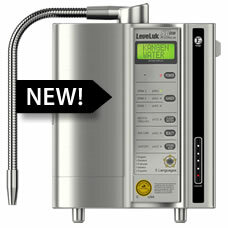 The new LeveLuk SD501 PLATINUM features a revamped modern design geared to match today’s more stylish kitchens. Same power and performance as the SD501 in an all new package! The industry-leading continuous ionized electrolysis water generator system, the SD501 PLATINUM is the finest machine in its class. With the strongest electrolysis chamber available, fully-equipped with a built-in electrolysis chamber, and featuring a large LCD panel and clear voice prompts, the SD501 PLATINUM is the leader of the pack.